Thanks to a grant from the PTCA, ANCS and Wesley International have partnered to bring the movie, Angst to our schools and the community. There will be a community showing of the movie, followed by a panel discussion and mental health resource fair. 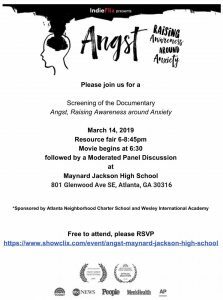 Please join us for this informative, helpful and FREE event on March 14th at Maynard Jackson High School. Doors open at 6:00 pm, movie begins at 6:30 pm. Free to attend but RSVP.